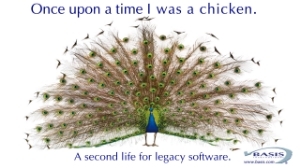 Upgrading vs Replacing — Curtis Martin Group, Inc.
You THINK your software is old and creaky. In fact it isn't at all. As a matter of fact if your software is more than 10 years old it is probably custom tailored to the way your company does business. You have probably spent thousands of dollars modifying different aspects of your software so it perfectly matches your requirements and workflow. It's less expensive - you already own the software. You control the cost. Implementation of the new GUI and BUI interfaces and screens can be done in stages or for just a specific application. There is no additional cost for increased functionality. We are just utilizing the modern functionality and reporting features built in to the latest version of BBj - and we use your existing programs and data files! There is NO COST for end user training. We are modifying your existing software. New ERP software can be very expensive. It can easily be in the $200.000.00 to $500,000.00 price range or more. There is also the $200,000.00 to $400,000.00 in modification costs to add the functionality and features to the new software that you've already had programmed in your current software. Some software packages cannot be modified. You have to request a new feature and hope the developer adds that new feature to a future release. There is additional costs incurred with converting your existing data into a form that can be read by the new software. You will incur the cost of training your staff in the use of the new software and there will be a loss in productivity while they learn it.